When my husband, son and I go out of town, we like to eat at restaurants that can only be found in the area we're visiting. This gives us a chance to sample local specialties plus, unlike chain restaurants, these establishments tend to offer a large variety of vegetables. Last summer on a road trip to Chicago, we stopped at a family owned restaurant in Missouri. There was an extensive vegetable selection so I ordered a vegetable plate with two of my favorites -- cooked cabbage and lima beans -- plus something I hardly ever see on a restaurant menu: pickled beets. The last time I'd seen and ordered pickled beets in a restaurant, I didn't care for what I received. I expected the beets to be cold, but they were served warm with bits of chopped onion. To ensure I didn't have a similar experience, I asked our server if the beets were served hot or cold. When she said cold, I decided to order them as my third vegetable. 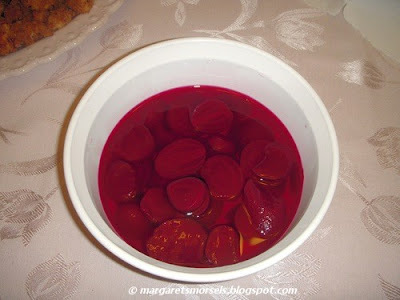 When our food arrived, I took one bite of beets and it was as though I was sitting around the oval dining room table in my childhood home. The beets looked and tasted just like what my mom used to serve with beans, corn and cornbread. As we left the restaurant, I told my husband I was going to find a recipe for pickled beets so I could make them at home. Fortunately, the search was quick and easy. 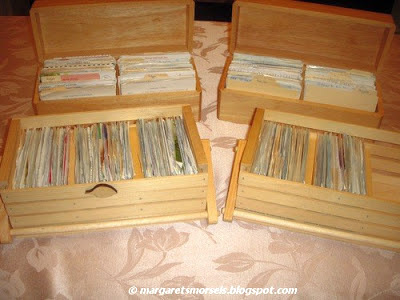 Over the years, I've collected enough recipes to fill almost four recipe boxes. These untried recipes are ones that sound good, but I haven't actually gotten around to trying yet. Filed under "Beets" was a pickled beets recipe I'd found years earlier. The recipe only uses three ingredients and, since it starts with a can of sliced beets, you don't have to cook or peel the beets. 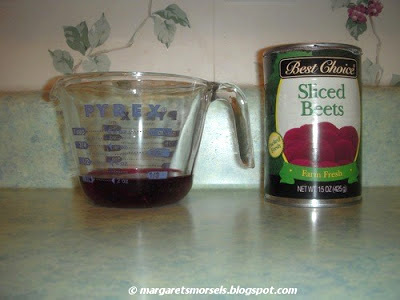 Drain a can of sliced beets, reserving 1/4 cup liquid. 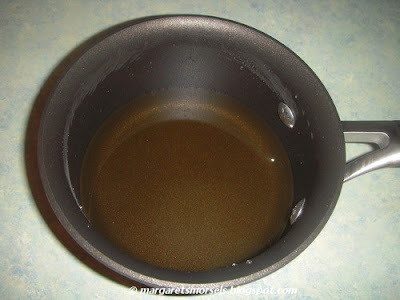 Put equal parts sugar and apple cider vinegar in a small saucepan. Heat over low heat until the sugar dissolves. Put the beets and reserved liquid in a glass bowl. 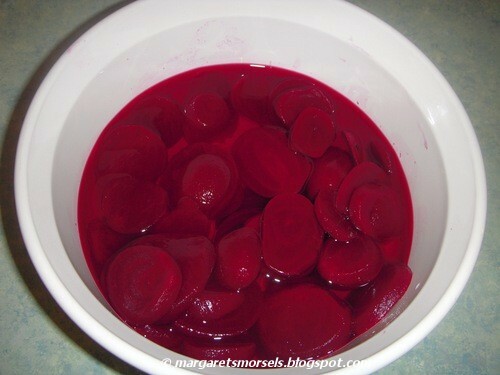 Beets are notorious for staining so you might not want to use a plastic bowl. Add the vinegar mixture and gently stir to combine the ingredients. Cover the bowl and refrigerate. The beets need to be refrigerated at least 4 hours before serving, but I think they're better served the next day after the flavors have blended. My husband and son don't share my enthusiasm for pickled beets, but that's ok. I don't mind eating the leftovers, especially since they taste just like mom used to make! 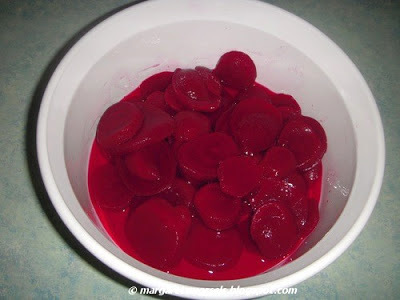 Drain beets, reserving 1/4 cup liquid. 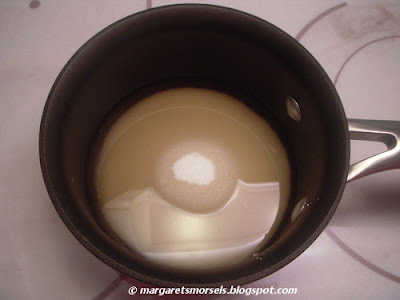 Put sugar and vinegar in a saucepan; heat on low until sugar dissolves. Place reserved beet liquid and beets in a glass bowl. Pour the vinegar mixture over the beets; stir gently to combine. Cover bowl and refrigerate at least 4 hours before serving.